FAIRPORT HARBOR, Ohio–North America's $137 billion metalforming industry is driven by the production of myriad precision metal products using stamping, fabricating, spinning, slide forming, and roll forming technologies, as well as vital value-added processes. In recent decades, approximately 3-to-4 million U.S. manufacturing jobs were lost to offshoring. The tide seems to be turning modestly in recent years as companies return U.S. production, or sourcing, from offshore. In comparison to 2000-2003, when the United States lost about 220,000 manufacturing jobs per year (net) to offshoring, 2016 achieved a net gain of 27,000. Progressively bridging this gap presents huge collaborative opportunities and challenges for all manufacturers, associations, employees, communities, and the U.S. government itself. The following Q&A explores factors that are key to the collective goal of gaining momentum in successfully returning the manufacturing of parts and products to the United States from offshore. 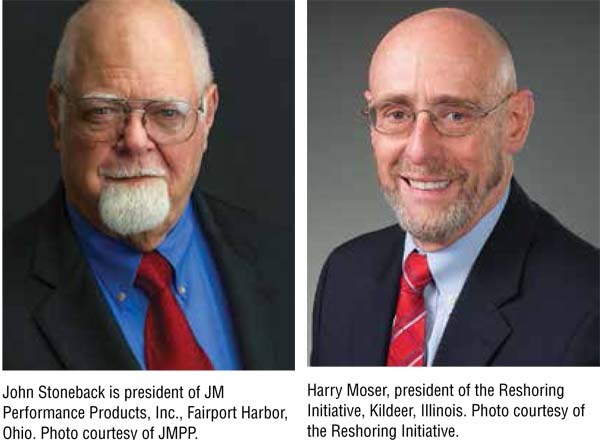 Authors of the Q&A are two men with a vested interest in the subject of reshoring: John Stoneback, president of JM Performance Products, Inc., of Fairport Harbor, Ohio; and Harry Moser, president of the Reshoring Initiative, based in Kildeer, Illinois. JM Performance Products, Inc. has been manufacturing CNC mill spindle optimization products since 2009. The company's Patented High Torque Retention Knobs overcome a critical "loose-tool" design flaw inherent in CNC v-flange tooling that was responsible for costly, industry-wide issues with CNC milling and boring that negatively impacted production costs, cycle time, and tooling costs. An essential element of the patented design is a knob that is longer and reaches a little deeper into the holder's threaded bore. As a result, all thread engagement occurs in a region of the tool holder where the diameter is large, and where there is correspondingly more material to resist deformation. The Reshoring Initiative, founded in early 2010, takes action by helping manufacturers realize that local production, in many cases, reduces their total cost of ownership of purchased parts and tooling. The Reshoring Initiative also trains suppliers in how to effectively meet the needs of their local customers, giving suppliers the tools to sell against lower priced offshore competitors. The Initiative is a nonprofit organization that offers manufacturers a number of free tools to advance their mission. The Reshoring Initiative and JM Performance Products both offer a free analytical tool that can aid manufacturers with identifying key cost analysis factors in offshoring versus reshoring production. JM Performance Products' return on investment (ROI) analysis shows exactly how much companies can save, and the overall value in production by converting to JMPP's High Torque Retention Knobs. The Reshoring Initiative's Total Cost of Ownership (TCO) Estimator helps decide whether the resulting lower manufacturing cost reduces the price gap enough to be overcome by the higher offshore "hidden costs." Although capital cost of machines is relatively the same in all countries, Stoneback and Moser agree that the key driving variable has always been cheap labor overseas, which drives a low part cost benefit. Q: What are the key variables that have driven domestic manufacturing overseas? Moser: When they first began to offshore, say, to China, the Chinese wages were so low that the price differential was, say, 30 or 40 percent. But now that the Chinese wages have come up, that price gap might only be 10 or 15 percent. As a result, even China is outsourcing to Malaysia for cheaper labor. Stoneback: U.S. productivity is 2-to-3 times that of the Chinese, so the key is to have the benefit of the advantages of reshoring be enough to overcome the remaining labor cost gap. Ultimately, at first glance, overseas is a low part cost benefit. Overcoming the shrinking emerging market wage advantages via factoring in all the intangibles makes reshoring a different story." Moser: Additionally, the current USD is 30 percent too high versus other currencies. Corporate tax rates are too high, there's no Value-Added Tax (VAT), [there are] too many regulations, healthcare costs are too high, oil prices are low, and there's a weak skilled workforce. We'll need stronger innovation and some confidence that the current administration will overcome some of these negatives, so the price gap will shrink enough that companies will start to see that the "hidden costs" of offshoring close the deal. Q: What are the key variables that can currently encourage domestic manufacturing to reshore? Stoneback: The simple fact is that there are always three key benefits in reshoring: cost, time, and insurance. Maybe even a fourth factor–inventory and space logistics. Those factors are so small to consider if you're manufacturing in the U.S., that you can do the math in your head, as it's a simple cost analysis." Basically, there's more control as the ability to guarantee delivery within five days or so, even by truck, anywhere in the U.S. is reasonable. Therefore, it's easier to keep the supply going smoothly without any overseas delays or surprises! Even the weather is a factor in delivering from overseas. The fact is, in overseas production, you can anticipate having delays, spreading out money over time, multi-line invoicing, and increased insurance–plus you may have to over-produce to anticipate needed demand. In the simplest terms, you can anticipate approximately 4-to-5 times shipping cost variance in bringing products in from China versus the U.S. That's not even factoring in the importer's mark-up on products from overseas, which could be upwards of 15 cents on the USD." Moser: There are advantages of building dies in the U.S. to manufacture components, and we should be focused on bringing them back. Factors such as duty, freight costs, tied-up cash flow, poor product quality, intellectual property risk, and delayed delivery are all reduced. There also would be the value-added benefits of ease of attending run-off, ability to send the die back quickly for correction, spare parts availability, and ease of partnering with the customer, amongst others. Stoneback: When we send high volume production work overseas, they don't make one die here. Dies are produced cheap for plastic parts overseas, and they just throw them away and send another in from overseas at pennies on the dollar, versus refurbishing existing dies. When dies are manufactured in the U.S., we make the molds to last and can customize to the application, provide rapid prototypes, obtain first article approval quickly, control cost of ownership, and have the ability for the customer to come back whenever they want–and the mold is still there for the next order." Q: What are the key short/long term variables that can promote a domestic manufacturing renaissance? Moser: Nationally and corporation-wise, we need a more highly skilled workforce, advanced basic education, and improved automation. By promoting partnerships with Skilled Workforce and Economic Development Programs, embracing U.S. companies with reshoring-focused technologies, like JMPP, and the use of the Reshoring Initiative's Total Cost of Ownership Estimator®, we can collectively make reshoring a more viable short and long-term platform for more orders, jobs, and profitability. Stoneback: In today's offshoring climate, we're left with more short order production runs. We need to train our workforce so they can handle the capacity of the jobs that are big in volume, [and] that can create long-term employment. Plants overseas use less and less people and more robotics–we need to train people so they are skilled craftsmen again. Moser: Obviously, reducing labor hours is most important, since U.S. wage per hour for labor is higher than overseas options. For example, manufacturers that have technological advantages of reducing production time in areas such as milling machine, polishing, and refurbishing would be significant." Stoneback: Education is a factor. Approximately one-third less training is required for a CNC milling person with our High Torque Retention Knobs. Additionally, there is no variance with our product, as you set up the job once and use them the same way, identically, so there's no additional set-up time. In fact, a single operator can run at least one additional milling machine, upwards to a max of four, once the work piece is set. You just press a button on the machine. Imagine the production savings in that equation in reducing cycle times, labor costs, and delivery time–all while improving quality and surface finish. Q: How can your analytical tools, such as TCO and ROI calculations, help manufacturers quantify the "hidden costs" of offshoring versus reshoring? Moser: Most companies make sourcing decisions based solely on price, oftentimes resulting in a 20-to-30 percent miscalculation of actual offshoring costs. The TCO Estimator is a free online tool that helps companies account for all relevant factors–overhead, balance sheet, risks, corporate strategy, and other external and internal business considerations–to determine the true total cost of ownership. By leveraging this information, companies can better evaluate sourcing, identify alternatives, and even make a case when selling against offshore competitors. It's a free tool on our website: www.reshorenow.org/tco-estimator. The TCO Estimator has been used by hundreds of companies to quantify the "hidden costs" of offshoring or reshoring. It focuses on asking the companies what products are causing "pain"–large hidden costs. They use TCO to find the products where the hidden costs are greater than the price gap. Morey Corp. used our Estimator to show that even though its price was higher than the Chinese competitor, its TCO was lower and saved a $60 million order. Stoneback: Typical CNC milling centers are running machines 20 to 40 percent slower than they should be. If you are able to significantly increase the speed of machines via eliminating the deficiencies of conventional retention knobs versus JMPP High Torque Retention Knobs, conservative estimate savings of 10 to 15 percent can be achieved. We offer customers a free analytical conversion consultation based on ROI in using our product, which can assist them in determining overall production savings in manufacturing. It starts with a simple equation: At a conservative minimum of 10 percent productivity increase using our High Torque Retention Knobs versus conventional knobs, how would it affect the health of your company? Take the number of mills in your shop and multiply that times the number of hours per day you run. Now take that number and multiply it by the number of days per week that you're running the mills. Multiply that number by your hourly billable rate. Now multiply that number by 52 weeks. The number you calculated is your unadjusted yearly revenue. Now, take that yearly revenue figure and multiply it by 10 percent–that's the number that represents your annual lost revenue. A simple example: 1 mill x 8 hours per day = 8 hours; 8×5 days per week = 40 hours; 40 hours x billable rate of $100 = $4,000 per week; $4,000 x 52 = $208,000 annually. $208,000 x 0.10 = $20,800 lost revenue per year. Q: What does the future climate hold for advancing this reshoring renaissance? Moser: Reshoring is showing incremental strength across the board in leading industries, such as transportation, equipment, appliances, plastic and rubber products, fabricated metal products, electronics, and apparel. If reshoring continues to progress in the long term, it will help eliminate the $500 billion trade deficit, avoid the collapse of the USD, cut the budget deficit in half, strengthen recruitment of skilled workforce, stabilize the military industrial base, fix income inequality, and enhance innovation. Stoneback: For companies with unique technologies such as ours, it's as simple as converting existing CNC systems to the new knobs to immediately reduce manufacturing costs, and educating people how to do setups and working the parts. Ultimately, less training and less tooling–everything is a plus, as a 10 to 30 percent overall productivity increase is a realistic and achievable goal. With the High Torque Retention Knobs, you start subtracting 20 percent on time, tooling costs, education, and job set-up, and there's no maintenance. Any product that requires a lot of people to make is going to be desired by all sides, and we need more of these high volume production jobs reshored. Our product proves that no matter what you are making, you will increase production. By doing it in the U.S., shipping and insurance factors are eliminated. There's no need to bring in more inventory in advance, and you can do it at home quicker!" For more on JMPP's patented High Torque Retention knobs (jmperformanceproducts.com), see Is a Small Design Flaw Robbing Manufacturers of Valuable Time and Productivity in Milling Operations? For more about the Reshoring Initiative, visit reshorenow.org.